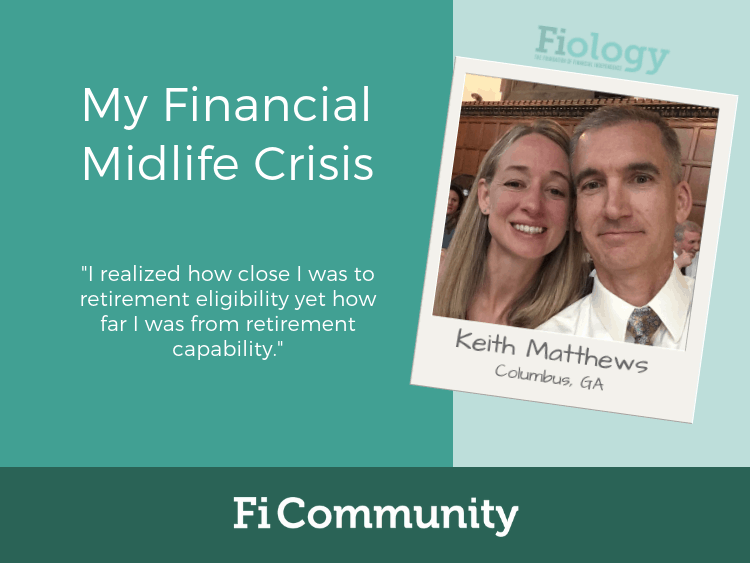 My midlife crisis came two summers ago when I realized how close I was to retirement eligibility yet how far I was from retirement capability. I was talking to a colleague and close friend of mine about our years in the education field, and it hit me. I would be eligible to retire from teaching in 8-10 years! I would also have two kids approaching college years and my retirement portfolio looked a lot like it did when I got married at age 32, only now with accumulated debt. Yikes! Time to get busy. Being single into my early 30s, I did a pretty good job with retirement saving and planning thanks to my Dad’s advice and a relatively inexpensive lifestyle. Lifestyle inflation began when I began dating and continued into my marriage. Relying only on a single source of income to fund our lifestyle, we took on student loans to fund my wife’s degree in veterinary medicine and saving and investing came to a halt. Once she graduated from vet school, it only made sense for me to go back to school for another graduate degree. And let’s throw two kids in the mix for good measure. I do not regret our decisions. However, as a guy facing the effects of these decisions in my 40s, I now assessed this as a crisis. Although I’ve always been rather frugal and had an awareness of saving and investing, my FI journey can be measured in months rather than years. How can a well-educated person increase his income and get back on a good financial track? Bartender? Uber driver? Amazon Sales? Consulting? Ah, of course, Real Estate! This made perfect sense, so let’s dive in head first. I spent the better part of a year educating myself in everything real estate and taking action. Lucky for me, I did not lose money during this time but I didn’t make much either. I completed a couple of wholesale deals (not for me) and one fix-n-flip (bad for my blood pressure). I learned a ton about the business and also about myself. I certainly plan to continue with real estate but more as a means of diversification rather than a business. The real benefit to my financial life came when all of the books, podcasts, and blogs about real estate led me to the Financial Independence Community. I immersed myself in everything available and knew it was time to redirect my energy and take (different) action. After I finished beating myself up for not continuing what I had started in my 20s, I got back in the game. With a wonderful wife and kids on board, we began tracking our spending, cutting expenses, budgeting, increasing debt payments, renting out rooms for short term rentals; if it was recommended by the FIRE community, we did it. The key for me at this point was having an adventurous and supportive spouse. From the decision of getting married, the decisions of having kids, and the decisions that shaped our careers, we’ve always taken the time to talk about and plan our lives. After a series of discussions about trading a few luxuries for our family’s future, we were excited for the change. We became serious about tracking our spending, increasing savings, and making those small Mustachian changes to keep us mindful of our needs versus wants. If I were to recommend a starting point for those who want to take a new direction, this is it: educate yourself, communicate often, make written goals, and pay attention. As excited as we were about our new focus and journey, we soon realized our current efforts weren’t enough. We had over $90,000 in student loan debt and were barely moving the needle. We decided to sell our home. We got a great deal on it just four years prior, but it was really more space than we needed and too much to clean, too much to heat and cool, etc. Downsizing would give us the opportunity to significantly reduce the student loan debt and get back on track for college and retirement savings. So, back to real estate! My connections in town led me to a fixer-upper in the same neighborhood where we already lived. We made a relatively low offer on the home which was accepted after some negotiation and I used a commercial line of credit I was using for real estate transactions to close quickly and get started on renovations. After about a month of renovation on the future house and some updates on our then current home, we listed our home and it went under contract for slightly less than our asking price IN FOUR DAYS! In a state of disbelief, we held our breath all the way to the closing table. We had to move fast and into a house that was not yet ready. Within about six weeks of making this huge decision, we found ourselves washing dishes in the bathtub of our live-in flip. Once the dust settled (literally), we had reduced our living space by about 1500 square feet. In our opinion, it’s a small price to pay for being debt free. We were able to pay off the student loan as well as the car note and make a substantial improvement to our savings rate. I cannot count the number of ways this has changed our lives for the better in a very short amount of time. Typically, a person experiencing a midlife crisis makes drastic changes to their current lifestyle. I made drastic changes. But, where many would have opted for a new Porsche, I opted to become debt free. My midlife crisis is about eighteen months in my rear view. Now what? My wife is passionate about her career, so she will stay in “save the world” mode for a while. Me? I think I’ll work on putting the RE in FIRE. Well, I thought that’s what I thought until I recently attended CampFI Southeast in Florida. I had a blast meeting so many people on similar journeys and was hoping to find clarity about my future endeavors but my CampFI experience had the opposite effect. There are so many exciting opportunities from here, it seems impossible to decide. Keith, it was great to meet you at CampFI this year. Thanks for sharing your story! Right?!? Happy to pay those bills now. An important takeaway from your story was how you dealt with your “mid-life crisis” realization. It can be easy in those moments to let feelings of guilt and regret set in, which is not only demotivating but can impact how you think back on those years. As you said you don’t regret those decisions but instead are choosing to appreciate the career & life experiences that brought to your family. Stories like yours are important to share because it serves as a good example for people in similar situations see that, a) it’s indeed possible to pursue financial independence even if you’re starting later in life, and b) appreciating where life has taken you is much more productive than letting it dominate your narrative going forward. Thanks for the comments Ian. I feel super fortunate that we live in a time that allows us to find unlimited resources to accomplish our goals in a relatively short amount of time. A simple internet search and some willingness to take action is like a giant catapult. Your determination and perseverance is contagious. You never gave up and are able to share an incredible journey that will impact the lives of others. Keep on keeping on!